Meagan Krumel, representing Nebraska, of Omaha, NE was crowned the 2015-16 Miss Czech-Slovak US Queen, she is the seventh Neberska queen to wear the national crown. She also was awarded the Authentic Kroj Award. She was also awarded a special educational scholarship donated by Dr. Cecelia Rokusek, Slovak Honorary Consul of Florida. Dr. Rokusek dedicates this scholarship to her parents John and Alicia “Fiala” Rokusek. ​Gabrielle Salva representing Missouri of Kansas City, MO was crowned the 2015 1st Runner-Up. Christiana also received the Talent Runner-Up Award..
​Christina Hochla representing Oklahoma of El Reno, OK was crowned 2015 2nd Runner-Up as well as Grand Talent Winner, Sokol Award, and Americanized Kroj Award. 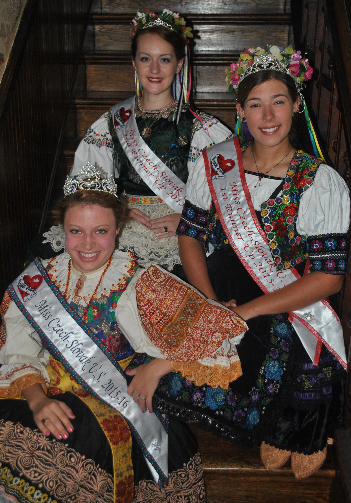 ​Elizabeth Kaliska, representing Minnesota of St. Paul, MN was awarded the Oratory Award..
​Sara Vytlacil, representing Kansas of Belleville, KS was awarded the Lois Fiala Spirit of the Czech/Slovak Heritage Award. This award is presented to the contestant who exhibits outstanding passion and dedication to her heritage. Sara also received Sokol Talent Runner Up. ​Allison Sexton, representing Texas, of West, TX was awarded the Heritage Involvement Award. This award is presented to the contestant whom exhibits outstanding involvement as presented on her application. ​Angela Kochan, representing Wisconsin, of Fon Du Loc, WI was award Miss Congeniality. This award is voted on by her fellow pageant contestants. ​The pageant also had an additional outstanding contestant Liz Kubal representing South Dakota of Tabor, SD.